When it comes to reading and studying Old Testament narratives, paying attention to detail really pays off! It is a rare exception when an Old Testament narrator tells the reader something as explicit as, “But the thing that David had done displeased the Lord” (2 Sam. 11:27). More frequently, a biblical narrator will lead us on a journey of discovery. This method is what Old Testament scholars refer to as “showing” rather than “telling.” Revealing a person’s character or proclaiming a particular message by “showing” is certainly a more interesting and artistic approach, but it also makes interpretation more challenging for the reader. Understanding that the biblical author is primarily communicating to us by “showing” should make us alert to the little details that occur in a story. Recognition that writing in the ancient world was an expensive process, and that the Hebrew authors of Old Testament narratives are very succinct in relating an event, makes it even more evident that every word in a story counts. So what kind of details should a reader be looking for? It’s impossible in this short article to make an exhaustive list (not that I could anyway), but I will attempt to offer a few suggestions and provide illustrations of the kind of attention to detail I am talking about. Among Old Testament narratives that are considered confusing, the difference between Cain and Abel’s sacrifices ranks high on the list. 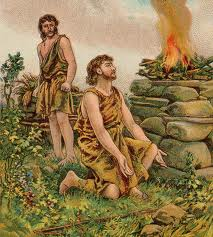 The story of Cain and Abel’s worship in Genesis 4 often causes confusion for readers. Why does God prefer Abel’s sacrifice to Cain’s? Some have suggested that God prefers a blood sacrifice and thus He rejected Cain’s offering from “the fruit of the ground” (Gen. 4:3). Others say, it is impossible to know. Still others fall back on the words of Hebrews 11:4 which states that Abel’s offering was preferred over Cain’s because he offered it by faith. While this is true, where did the writer of Hebrews get this interpretation of the events? Was it by divine revelation, or is there something in the text that points in this direction? Actually, there is. A careful reading of the story shows that Cain’s offering is much more general, suggesting less care and less devotion to God. Cain is said to offer “an offering,” whereas Abel’s offering is said to be of “the firstborn of his flock and of their fat” (Gen. 4:3-4). In other words, Abel brings his best to God and that is the difference between the offerings. The fact that the same word is used for “offering” for both Cain and Abel (even though an animal offering would normally use a different word), and that God does accept offerings from the ground as acceptable sacrifices (Lev. 2:7-16), further demonstrates that God does not reject Cain’s offering because it is a bloodless sacrifice. The key to the story is in the details of Abel’s offering found in the words “firstborn” and “fat.” Observation of such details ends many debates, solves much confusion, and prevents possible misinterpretations of the story. One of the small details often overlooked when reading Old Testament narratives are the tags applied to people’s names. By this I am referring to the little descriptions that follow people such as Abner, the son of Ner, or Uriah, the Hittite. Sometimes these little tags appear to define who a person is or what their relationship is to someone else. However, once their identity is established, there really is no need for the tag. Thus when a tag is constantly used the reader should suspect that there is more to it than simply identifying a person. Saul’s daughter Michal is an excellent example of this. Every time Michal appears in the story of 1&2 Samuel, she has a tag applied to her name. When she is first introduced she is called “Saul’s daughter” (1 Sam. 18:20). The next time she appears in the story she is called “David’s wife” (1 Sam. 19:11). Michal’s protection of David in this story suggests that the title “David’s wife” is more than a tag reminding us of her marriage to David. It signifies where her loyalty lies, since Saul is out to kill David. The next two times Michal appears in the story we are told she is “Saul’s daughter” and “David’s wife” (1 Sam. 25:44; 2 Sam. 3:13-14). Since Saul and his family remain at odds with David, these tags suggest a tug of war for Michal’s identity. Which is she, Saul’s daughter or David’s wife? The question is finally answered in Michal’s last appearance in the story. In 2 Samuel 6:16, we are told that Michal (who once upon a time loved David–1 Sam. 18:20, 28), despised David. In this verse, and also in 2 Sam. 6:20-23, she is referred to only as “Saul’s daughter.” This tag suggests that Michal’s affections have come full circle and that she has chosen to identify with her father Saul, rather than with David (for a more in-depth exploration of this idea see my book, “Family Portraits” chapter 10). When the time of day is mentioned in Old Testament narratives, it is important! If a biblical story mentions the time of day, it is usually important. For example, the angels arrive at Sodom in the evening (Gen. 19:1), and by the time the threatening mob gathers it is night time (Gen. 19:5). The destruction of Sodom occurred at sunrise (Gen. 19:23-24) which was considered the time for judging a case in the ancient world. 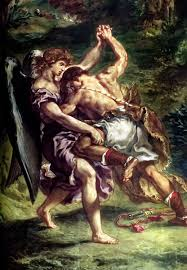 Another example of the use of day and night occurs in the story of Jacob’s wrestling with an angel. The wrestling match happens at night, matching Jacob’s fears and uncertainties as he approaches his brother Esau (Gen. 32:21-22). The wrestling match ends at the break of day (Gen. 32:24, 26), at which time Jacob is blessed and receives a new name. As Jacob limps away from this mysterious encounter we are told that “the sun rose on him” (Gen. 32:31), suggesting that a new day has dawned. But the writer is not interested in the new day for its own sake. The time notice makes clear that it is a new day for this man who now faces his future, not as Jacob, but as Israel! 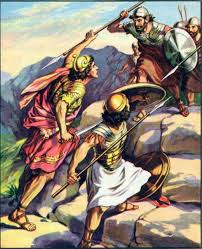 Jonathan’s words to his armor bearer show him to be a man of faith. Contrasting actions, personal tags, time of day, and the initial words of a character, are just a few of the many small details found in Old Testament narratives that aid one in biblical interpretation. There are many other things that easily go overlooked, or are taken for granted when reading Scripture. 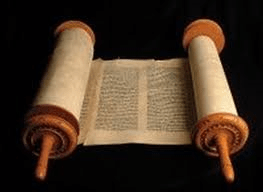 Hopefully this article will encourage each of us to read the Old Testament more carefully, not looking past the obvious clues that the author has placed in the text. One word of caution: We should always allow context to guide us on how important a particular detail might be. In other words, a small detail may contribute to an important insight, but we should not magnify that detail beyond what the text warrants. It is a mistake to make the passage about the detail, rather than to allow the detail to assist us in the interpretation of the passage. The next time you read an Old Testament story, remember to enjoy the details!